Wearable devices already monitor and track our activities and anticipate and react in a variety of ways and situations. In some cases these devices are even context-aware. What's enabling this explosion in wearables? How might business processes, entertainment, healthcare and other industries leverage these new devices? How will insights and information gleaned from wearables impact our future interactions as data on biometrics, activities, preferences, and location become commonly collected and made available for analysis? 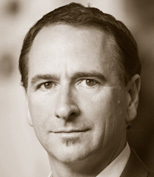 Joe Burton serves as Chief Technology Officer and SVP of Technology, Development and Strategy for Plantronics. In this role he is responsible for setting and driving the company's technology direction and leading its global engineering teams and programs. Prior to joining Plantronics, Burton held several key executive, engineering leadership and architecture-level positions at Polycom, Cisco, and Active Voice. During Burton's 10 year career with Cisco, he served as the company's Chief Technology Officer for Unified Communications, encompassing call management, IP phones, contact center, conferencing, unified messaging, unified communications applications, and advanced technologies and products. At Polycom, Burton led the long-term strategic agenda and next-generation focus areas. Joe Burton is the author of several communications patents and holds a Bachelor of Science degree in Computer Engineering from Regents College in New York.